It has been my personal goal to have my cats live well into their late 20’s or longer if I can. I was successful for four to reach 17,19 and 20 when all their organs were normal yet cancer is what took them. Still, that void they left in my heart and life, even losing them at that age, left a huge void in me that still causes me sorrow when I remember them every day. Thankfully, my kitty Alex (nine years now) has been filling that void with his deep purrs and cuddles. Alex is always either on my desk helping me work if he’s not watching butterflies, squirrels and birds through our office bay window or sun room. I have recently started my Alex on a daily immune system wafer, Colostrum on his meals, a TINY bit of Ester C in his meals a few times a week to see if I can build a stronger immune system to help prevent cancer. And for his teeth I give him once a day some plain raw meat or chopped in small quarters, chicken neck. So far, he has not had to have his teeth clean and that is GREAT for his age. Of course, I don’t vaccinate my cats anymore either. I did a great deal of research and had talks with my vets about the ongoing epidemic of cancer in all our animals. Every one of the vets said they see more cancer now they have in their whole life as a vet. Yes, most of us know that cancer can stem from vaccines and commercial foods, but there is more that causes cancer and its right under our noses. 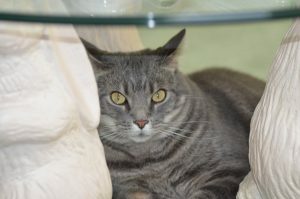 I talk to cat lovers daily and I sometimes ask them what they use for watering bowls and dishes and many of them say they use those plastic watering fountains. As soon as I tell them my story of why I felt my cats got cancer and how I know this, they throw theirs out just like I did when I realized how filled with cancerous toxins they really are. 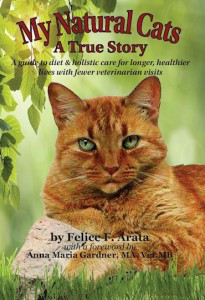 The chapter on this is in my book, “My Natural Cats” www.mynaturalcats.com and will explain this and so much more to help you raise healthier cats and dogs with a comments from my vet Dr Reeves, Dr Gardner and various other holistic vets I worked with through the years. I have been asking how long can our cats live and getting the same answers as you may have. Yet, I’m just not satisfied at those answers.Case in point, BrightHaven.org, a holistic no kill sanctuary, has cats that come to them with serious health challenges that I have never had to deal with and several of them have lived to the high 20’s and one in his early 30’s with the holistic care and raw diets like I do. So, why can we? It is my opinion that cats can live longer if we care for them as close to natural as possible and support their organs along with a healthy balanced raw diet. Also, treat health issues with homeopathy care from a homeopathic vet like I did. Drugs always have side effects that allopathic vets pay no attention too and then treat those symptoms which have more side effects. Yes, sometimes a drug has to be given but back it up with a holistic vets care to minimize the side effects.We do have to remember though we live in a toxic world filled with cancer causing toxins; I use vinegar and water to clean floors and counters for starters. The air we all breathe is more toxic now then 30 years ago; therefore, we need to support their immune system, individual organs and detox their liver more often before we see the liver levels creeping high on their blood work or see symptoms of liver failure starting; generally, by then it’s almost too late to reverse. Yet I was successful in reversing the liver and did it twice. That too is in my book, “My Natural Cats”. Did you know the liver is the easiest organ to cure? The liver in both humans and animals can rejuvenate itself daily. However, when the liver builds up with too many toxins over a period of time without detoxing it with milk thistle (read my book), you’ll see liver failure happen very fast because cats hide symptoms of liver and kidney problems until it’s almost too late to stabilize or reverse. Get blood work once a year and when your fur friend is older get it twice a year so you can get see if there is a problem starting before it’s too late.